Submitted by Dan Dooré on Tuesday, May 15, 2018 - 13:34. The Art Package bundled with the Coupé for which Bo gave up his summer of 1989 to produce for MGT . Based on this high-quality packages The Artist One/Two for the ZX Spectrum it was the first major application for the platform. The multi-mode, split-screen editing to keep the menu bar on screen was different from the now more normal ‘screen swapping’ method used by Atari ST and Amiga packages. Flash! gets a lot of bad press when compared to other art packages such as Sam Paint and ones on other platforms but remember that this application was written not so much in the Coupé’s infancy more like when it was embryonic. Flash! was supplied in the MGT Utility Tapes and also available on the SamDOS disc. Your Sinclair YS51 review (Recovered), courtesy of The YS Rock ‘n’ Roll Years. At last. No more blocky pictures that look as if they've been painted with a small vibrating lego brick from hell - and no more trying to draw the delicate petals of the Nettus Grimraut flower using a Konix Speedking! The SAM Coupe brings with it two things - a) Flash!, the free art package, and b) a hole in the back - in to which you can plug a MOUSE!!! (Erm, once you've bought one, that is.) So. What will you be able to do with Flash! that you can't do with Spectrum art packages? The answer is loads. First of all bear in mind that there isn't any attribute clash. No 'only two colours to a character square' here, matey - you can have as many as there are pixels. And considering that the actual number of colours available is 128, well, it's starting to sound quite good, isn't it? Carry on reading though, it ges better. Colours can be actually 'mixed' by the user - you can denote how much red, green and blue to use, and then allocate 'your own colours' to the Selection Chart. Then you can use the colours with the Paint Brush - you have everything from a fine hair-line brush to a big splodgy blob. Or maybe you feel the urge to be a wizard 'air brush artist' (or fancy doing some on-screen graffiti). Never fear, because there's the Spray Can to use too (it's pre-set with a fine nozzle spray, but you can select wider ones if you want). All other standard art package features are at your disposal too. There's the Fill Command, which will fill any shape you've drawn with either a solid colour or a pattern (such as 'brick wall', 'semitone' or one of the many others from the Pattern Selection icon). There are the 'shape commands', allowing you to create (with the utmost ease) circles, boxes and elipses. These can be filled or empty, depending upon the icon you click. And there are the line commands as well. The Continuous Line allows you to draw a series of straight lines (as few or as many as you wish), connected end to end. No faffing about with a ruler when you use a computer as an art tool. Or you can go for the Radiating Line - you choose a 'start point' and all lines drawn will radiate from it. Ideal for setting up perspective in a picture. There's a command called, erm, Blok (don't forget, Bo Jangeborg is Swedish). Highlighting this option means that you can take a square or rectangular portion of the screen (any size you wish) and move it around. You can then 'paste' it into position wherever you want, and as many times as you want, overlapping or separated. You can create brillo-coloured background patterns and suchlike (so you can even design some, er, curtain material or something). While you have a Blok pattern (or picture) in memory, you can manipulate it by pressing the keyboard. Mirroring, inverting, rotating - you can do all this and more. Similar to the Blok command is the Cut option, but instead of just cutting out a rectangle, you can remove, move and paste irregular shapes onto the screen. Want to move that banana to the left? No problem. There's the obligatory Text mode as well, so you can give your posters (or whatever) a bit of meaning with some well-chosen words, in a variety of type styles and point sizes (which is a posh way of saying 'largeness of the letters'). 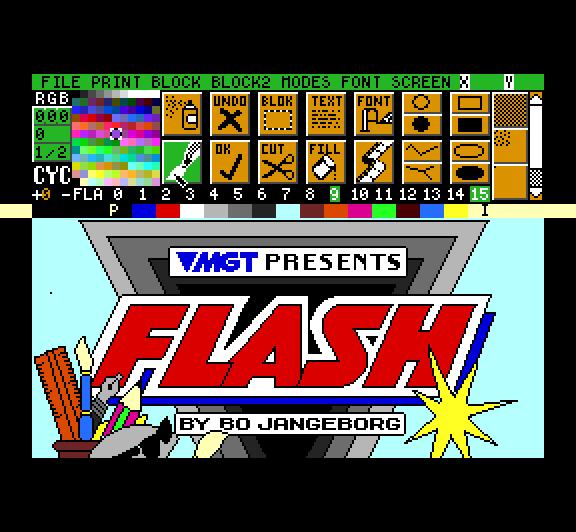 Not only can you produce stunning static graphics with the Flash! package, but there's actually a chance to make whole pictures move. That's right, there's an Animation icon. Yippee! You can create your very own cartoons, design alternative title sequences for TV programmes, draw a face in separate stages of speaking and then make it move (at any speed you want). The world is your oyster, as it were, limited only by your imagination. The whole package is WlMP controlled - that's Windows, Icons, Mouse and Pointers. You move the Pointer to an Icon with the Mouse (or joystick or keyboard) and 'click on it' to go into the required mode. Plus there are windows to 'pull down' from the top of the screen. These contain all kinds of other options, from Save (which, erm, saves a picture) to Spec Col (which instantly emulates the screen colours of the Speccy - but quite why you'd want to do this I'm not sure). Art Studio and Kempston Mouse owners will already be aware of what it's possible to do on-screen, artistically-speaking, but until now they've had to put up with the bete noir of the Speccy user - namely crap colour. Well, as I said before, everything you can do on Spectrum art packages you can do here - and quite a bit more besides (plus it's all in full colour). In fact Flash! is sort of like an ST art package that's had an accident involving the head (ie it's just as clever, but it's not quite as quick). The version bundled with the Mouse Interface disc had sluggish controls and also had the right-hand button as primary which drove people insane. There is an out-of-place pixel in the top left of the title screen.